I have a stamp which I have tried to upload but it has been refused as it may cause "malicious content"! No idea why, but I will do my best to describe it. It's rouletted rather than perforated. The centre of the design is a penny black, with the dates 1840 and 1990 on either side, so obviously commemorating the 150th anniversary of the 1st postage stamp. The word "Sonne" is above the picture, and "Empire" below it, with the "value" of 15 in each of the bottom two corners. The whole thing is printed on orange paper and not very professionally produced. Can anyone help me identify this stamp? 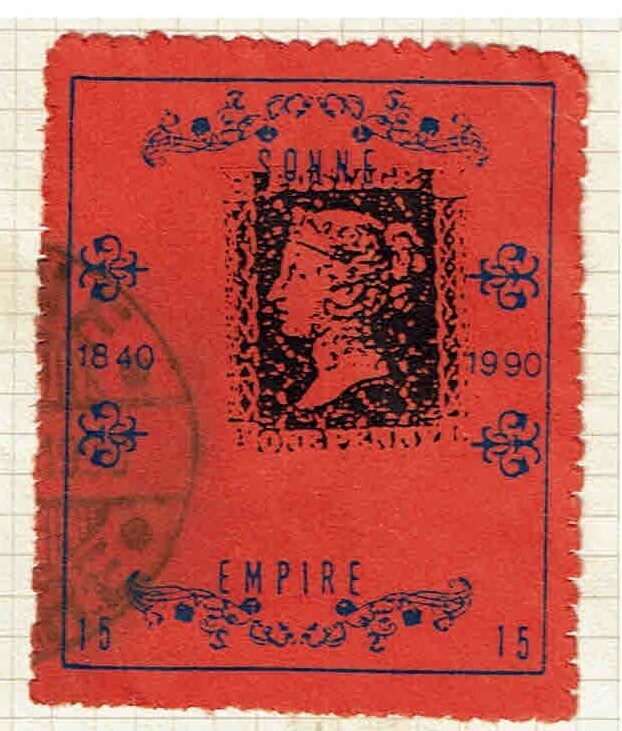 I've googled "Sonne Empire stamp" but even that has met with very little success, although it may be emanating from Australia.